State Rep. Justin Alferman, R-Hermann, thinks the Senate will pass the House’s version of proposed abortion regulations. 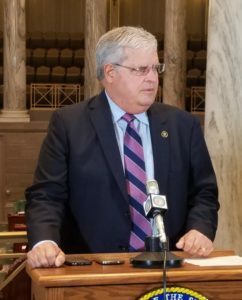 Senate President Pro Tem Ron Richard, R-Joplin, says there might have to be a compromise between the two chambers during a special session underway. The House made changes to a proposal the Senate passed. The lower chamber’s version includes unannounced annual clinic inspections, tracking fetal tissue after an abortion, outpatient surgery center-like standards, letting the attorney general intervene in local abortion court cases, specifying that only the physician performing the procedure can explain risks to patients, requiring clinics to have a plan for addressing any procedure that can cause complications, making it a crime if staff requests paramedics to respond without sirens and flashing lights, repealing a St. Louis ordinance that bars discrimination based on pregnancy decisions and calling for the facilities to have a system in place to transfer patients to nearby hospitals if further medical care is necessary. The Senate held a technical session Friday morning. It is expected to resume work around July 24.